Authoritative, clear, concise, and practical, this highly acclaimed book continues to be an essential text for all medical, surgical and health professionals who want to have an easily accessible, quick reference to systematically reviewing the literature. 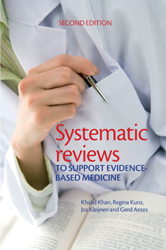 The authors are veterans of over 150 systematic reviews and have helped form policy and practice. They have ensured that this concise, practical text, which avoids technical jargon, continues to be the first reference for all health professionals undertaking literature reviews.